The Tang dynasty had its share of corrupt, incompetent and decadent leaders. One 8th century Tang emperor spent nearly all of his time hunting and kept 5,000 chows and a staff of 10,000 huntsmen. In the later years of his reign it is said, Xuangzong was so distracted by a concubine named Yang Guifei it led to the catastrophe of 755. Taizong (Tai-tsung, 597-649), the second emperor of the Tang Dynasty, is one the most admired Chinese leaders and is known for his love of art. He so admired the calligrapher Wang His-chi he took his famous work “Preface to the Gathering at the Orchid Pavilion” with him to his grave. Taizong coveted Wang’s original manuscripts were so greatly reportedly tried to obtain them by trickery from monk who was sworn to destroy them. Tang Dynasty China under Emperor Tang Taizong was a period of peaceful development of the Chinese economy, when the emperor put the emphasis in the welfare of his subjects, promoting a policy of low taxes and good treatment to the frontier minorities. Tai-tsung “was just the man for the times. He was open-minded, brave and extremely intelligent. Under his powerful leadership, Tai-tsung brought the Turks and the oases of the Gobi within his sphere. With his advent China was revealed to the astonished peoples of Asia, who tremble at the sound of his name. The emperor's home land lay along the Turkish frontier, so he was familiar with the problem of raids. In 630 Tai-tsung crushed the nomadic Eastern Turks who had been pressing southward from their base in Mongolia. Many northwest tribes in Central Asia sent envoys to seek Tang protection and presented the emperor with the title of Heavenly Khan, or the Khan of Khans, thus marking the beginning of a remarkable political-military alliance with territory extended to East, Central and South Asia. He was well respected not only in China but also in the Turkic regions. “As the trade became vitally important to Tang, Tai-tsung was anxious to clear the trade routes to India and Persia. He moved westward to conquer the Western Turks and other smaller states in Central Asia. The Chinese court now had diplomatic relations to the west of Pamirs. He directly ruled an area larger than that of the Han dynasty. The empire is firmly established and reaches the sky! Empress Wu Ze Tian, the first female ruler in Chinese history, usurped the throne in 690. The daughter of a Shanxi lumber dealer, she grew up in Shaanxi and was briefly a nun before she worked her way up to empress from a low-ranking concubine. Regarded as a tyrant, she reportedly killed many of her rivals and changed the name of the dynasty from Tang to Chou (or Zhou). It was changed back after she died. Empress Wu Zetian was the only female emperor in Chinese history. Her story has intrigued many in China, and has been the subject of a TV series. She expanded China, improved international relations and trade, raised the status of women and encouraged the arts. Under her rule great works of art such as Buddhist statuary, mounted dolls playing musical instruments, gold and silverworks, ceramics and glassware were produced. She reportedly had her own harem of men and is famous for being tactful with her husbands.. She was ultimately forced off the throne by a coup in 705 orchestrated by one of her sons. Yang Yuhuan (A.D. 719-756), an imperial concubine of Emperor Xuanzong of the Tang Dynasty, is commonly called “Imperial Concubine Yang” (Yang Guifei), with “Guifei” being the highest rank for imperial consorts during her time. She was born in an old, well-known official family. She was naturally beautiful with a docile character. She was gifted in music, singing, dancing and playing lute. These talents, together with her education, made her stand out among the imperial concubines and win the emperor's favor. Jade ("yu") was considered so precious that it was often used in women's names. Yang Yuhuan means "jade ring." Yang Guifei was the beloved consort of Emperor Xuanzong of Tang during his later years. Pink jade is associated with beauty, and it is said that Emperor Xuanzong would only allow Yang Guifei to wear it. There are many operas and shows based on their tragic love story. In A.D. 755, during the An Lushan Rebellion, as Emperor Xuanzong and his cortege were fleeing from the capital Chang'an to Chengdu, the emperor's guards demanded that he put Yang to death because they blamed the rebellion on her cousin Yang Guozhong and the rest of her family. The emperor capitulated and reluctantly ordered his attendant Gao Lishi to strangle Yang to death. According to one version of the story when Emperor Xuanzong and Yang arrived at the Mawei Slope, the army refused to march, for the army thought that the reason of this rebellion by An Lushan was that Imperial Concubine Yang's behavior of attracting emperor ruined the state and that her cousin Yang Guozong colluded with the enemy. To appease the army, Emperor Tang Xuanzong had no choice but to order Yang to commit suicide at the Mawei Slope. Yang was known for having a full and fleshy figure, which was a much sought-after quality at the time. 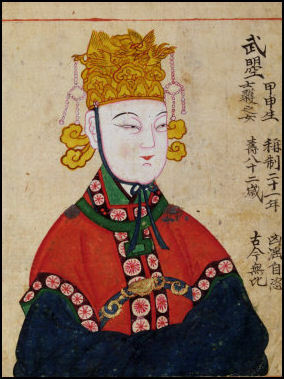 She was often compared and contrasted with Empress Zhao Feiyan, the wife of Emperor Cheng of Han, because Yang was known for her full build while Empress Zhao was slender. This led to the Four-character idiom “yanshou huanfei," describing the range of the types of beauties. The last great ambitious ruler of the Tang dynasty was Emperor Xianzong (r. 805–820), his reign period aided by the fiscal reforms of the 780s, including the government monopoly on the salt industry. He also had an effective well trained imperial army stationed at the capital led by his court eunuchs; this was the Army of Divine Strategy, numbering 240,000 in strength as recorded in 798. Between the years 806 and 819, Emperor Xianzong conducted seven major military campaigns to quell the rebellious provinces that had claimed autonomy from central authority, managing to subdue all but two of them. Under his reign there was a brief end to the hereditary jiedushi, as Xianzong appointed his own military officers and staffed the regional bureaucracies once again with civil officials. However, Xianzong's successors proved less capable and more interested in the leisure of hunting, feasting, and playing outdoor sports, allowing eunuchs to amass more power as drafted scholar-officials caused strife in the bureaucracy with factional parties. The eunuchs' power became unchallenged after Emperor Wenzong's (r. 826–840) failed plot to have them overthrown; instead the allies of Emperor Wenzong were publicly executed in the West Market of Chang'an, by the eunuchs' command.